During a Wednesday breakfast meeting hosted by the Central Aroostook Chamber of Commerce, Paul Towle, president and CEO of Aroostook Partnership, gave an overview of the organization’s short and long-term goals for economic development in Aroostook County. PRESQUE ISLE, Maine — During a Wednesday breakfast meeting hosted by the Central Aroostook Chamber of Commerce, Paul Towle, president and CEO of Aroostook Partnership, gave an overview of the organization’s short and long-term goals for economic development in Aroostook County. In response to the 2016 Caring for the Crown Report, which projected that The County would lose 6,000 people through out-migration over the next 10 years, Aroostook Partnership has set several workforce development goals that include: retaining youth who already reside in the area, attracting former residents, employing the skills of senior citizen workers in unique ways, and increasing people’s overall participation in the labor force. Though a formal report updating the Caring for the Crown statistics has yet to be published, Towle noted that he, and business and educational leaders who are part of Aroostook Partnership have seen a slow decline in out-migration over the past three years. They have increased their efforts to connect local students, even those as young as middle-school age, with employers and realize the career opportunities that exist in Aroostook County. 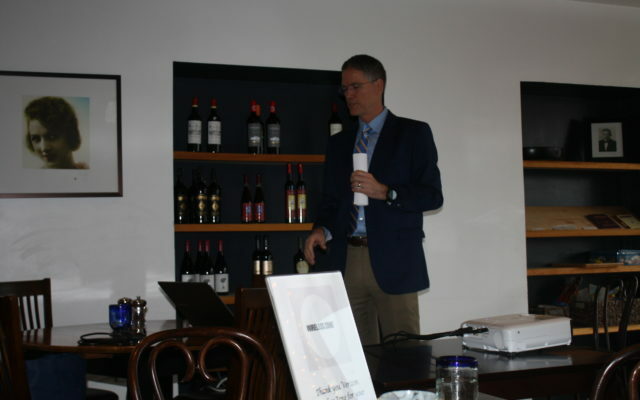 There is also potential to connect senior citizens to part-time work opportunities through scheduled arrangements that benefit both companies and workers, he said during the chamber’s eggs and issues breakfast meeting at Cafe Sorpreso in Presque Isle. But northern Maine still faces great challenges in making strides toward widespread economic development, he said. There are an estimated 11,000 Mainers who might be able to contribute to the workforce but don’t because of what economists call the “welfare cliff.” Towle explained that some individuals who receive state welfare aid fear potentially losing necessary benefits if their income surpasses a certain amount. “The Legislature has debated this issue before, but there must be a way to figure it out so that we gain more people for our workforce,” Towle said. Towle recently became a member of an Augusta-based committee focused on creating a 10-year strategic plan to build Maine’s economy. He plans to advocate for Aroostook County’s role in economic development while focusing on how the region can increase its own educated, skilled workforce. One way in which Towle recommends business, educational and public and private sector leaders do that is by vocally showcasing Aroostook County’s benefits. He referenced a recent study from the University of Minnesota titled, “A Rural Brain Gain Migration.” The research found that there has been an increase in people aged 30 to 49 years old who either return to rural Minnesota or move there for the first time due to five major reasons: a simpler lifestyle, safety and security, affordable housing, outdoor recreation, and quality schools. Towle pointed out that Aroostook County is not unlike Minnesota or other rural areas of the country. In creating its own list of reasons for people to move to Aroostook County, Aroostook Partnership includes the Minnesota study’s five reasons as well as a greater sense of community, and increased personal connections between neighbors, colleagues and friends. Aroostook Partnership is currently developing an “aggressive” marketing campaign to reach out to former County residents within the 30 to 49 age group who might take advantage of opportunities to move back to their hometowns. The benefits of rural living are those that Aroostook Partnership thinks also can extend to folks facing economic hardships in other areas in or outside the U.S. Recently, the Northern Maine Growth Initiative, a group of local educators, business, social service and faith-based leaders, worked with Catholic Charities USA to relocate families who were displaced by hurricanes in Puerto Rico. The families have since settled in Aroostook County and been accepted into jobs and higher education programs. Efforts to bring more and better wireless internet access to rural northern Maine also could improve many companies’ willingness to invest in the region. Certain out-of-state companies, he noted, hire employees who complete most of their work duties from home or a location not situated near their main headquarters. “Why move to Manhattan and pay $4,000 a month to rent an apartment if you could do the same type of job here remotely?” Towle said. He concluded his breakfast presentation by saying that he has met with business owners who are genuinely interested in the possibility of investing in Aroostook County. He feels confident about the overall efforts to strengthen the area’s workforce.